Enjoy a stylish and versatile sign light with the 10" Domed Shade Gooseneck Fixture. Featuring a long arching arm that can go up and over the top of awnings or other architectural features, this all-aluminum gooseneck light is the complete storefront lighting package. Mounting is via two sturdy back plates, and swivel couplings are available to add for adjustable sign lights. 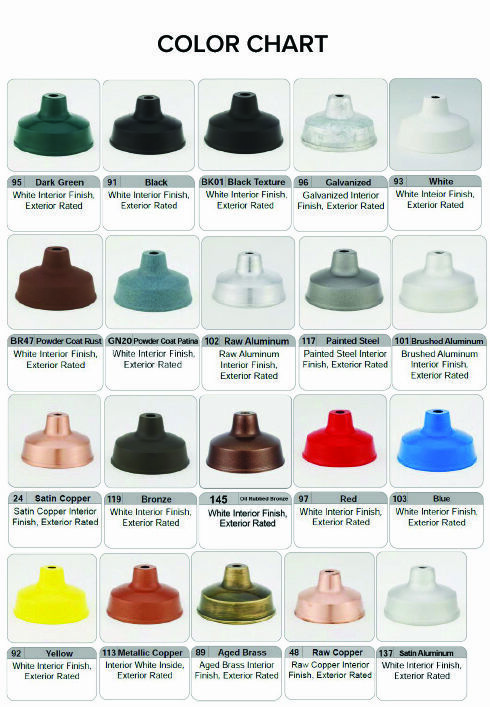 And choose a rust resistant powder coated finish from our 25 attractive options (pricing will vary). Outdoor gooseneck lighting comes standard with incandescent lamping. This fixture is rated for a maximum 150-Watt bulb for a brilliant glow. Back plates measure 4 5/8" in diameter and have mounting holes at 3 1/2" on center for easy installation to a 4" round or octagon J-box. All parts are powder coated to match except for the inside of the shade is left white. For custom commercial lighting combinations, to add swivel couplings or to upgrade lamping (CF, MH, HPS or LED) please call toll free for a price quote.